Pednagothollan is a beautiful Victorian villa with three bedrooms, two bathrooms and the most wonderful sea and coastal views towards Kynance Cove and around Mounts Bay to Gwennap Head. Within easy walking distance of the coastal path and Lizard village, Pednagothollan provides very comfortable accommodation for up to six people. With driveway parking for three vehicles and an enclosed garden with Summer House. The nearby South West Coastal Path gives access to miles of stunning coastal walking in either direction, northwards to Kynance Cove and, for the more energetic, beyond to Mullion Cove. Or southwards to Lizard Point, continuing to Cadgwith Cove for lunch at the Cadgwith Inn before the return walk. Lizard village is a level 10 minute walk and has a choice of eateries and pubs including arguably the best fish and chips on the peninsula! There's always something going on in this thriving community from live music to classic car shows and the beer festival - you are most welcome to join in. The ground floor has been redesigned and extended. There is now an open plan kitchen / dining / living area with the most spectacular coastal views of Kynance Cove and the cliffs. A decked walkway wraps around the side and back of the property which is accessed from the new extension via 2 sets of glazed triple sliding doors. Watch the sunsets from the new extention through the full length glazed doors on the comfortable sofas. The dining area has a large dining table which can seat up to 10, with a corner bench and chairs . The kitchen area is equipped with a large 5 ring hob, built-in Neff slide and hide oven, built -in Neff microwave oven , large fridge freezer with water/ice dispenser, dishwasher, standard microwave, toaster and kettle. The Aga in the kitchen is not for use. Access to the property can also be through the utility room off from the kitchen which has a washing machine, tumble drier and another glass door fridge along with a separate toilet with handbasin. The main lounge area provides a wonderful, large living area. It has two three seater sofas and 2 chairs with stunning sea views from the bay window. There's a large LCD TV with Sky (Basic package) and a fireplace for your use (Please supply your own logs), also a few children's toys can be found in the cupboard . There is a second, smaller snug lounge with the same views, which holds board games for your use, sofa and arm chair and double doors that open onto the decked area and the garden. On the first floor are the three bedrooms and a family bathroom. Bedroom one is the master en suite room with breathtaking views that you can enjoy from the super king sized bed along with a smart tv. There's a large dressing area with wardrobes, a dressing table, bedside tables and two chairs. The en suite has a shower cubicle with mixer shower, toilet, handbasin and heated towel rail. Bedroom two enjoys the same amazing views and has a kind sized bed, chest of drawers and hanging space. Bedroom three with twin single beds, chest of drawers, hanging space and a bedside table with lamp. The family bathroom has a sunken bath and separate shower cubicle with a mixer shower, matching toilet and handbasin. The large decked area steps down on to the spacious garden. Please supervise children and dogs when outside. The substantial Summer House has lounge furniture, another under counter fridge, chest freezer and a dining table and chairs. 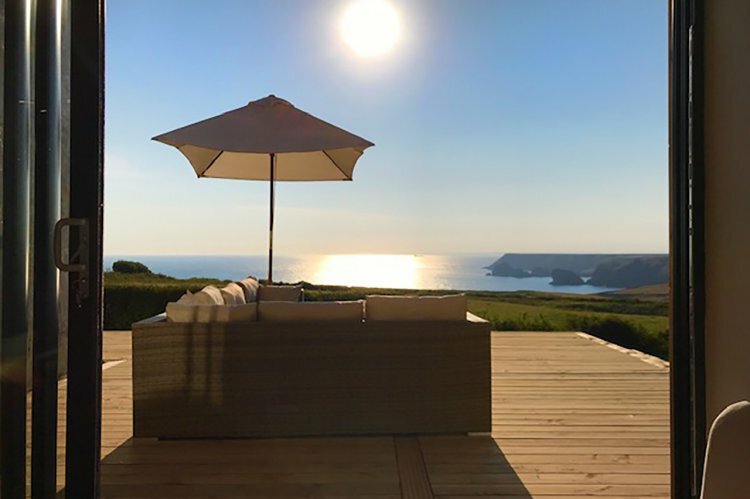 The summer house provides another perspective to enjoying one of the best views in Cornwall. There is private parking for two vehicles, while next door is a semi detached private residence. Rental includes bedlinen, towels, central heating and electricity. All of our properties are non-smoking. Up to two well-behaved dogs are allowed at Pednagothollan by prior arrangement at £25 per dog, per week subject to terms and conditions. Open Fire in Lounge, 2 sets of sliding triple doors, Summer house. Seating/Dining area with 2 sofas, sliding triple doors on 2 sides, table and chairs for up to 10 people. Large open plan kitchen area equipped with electric oven, 5-ring hob, slide and hide oven, microwave oven, fridge freezer, dishwasher & microwave. Utility room has a washing machine, tumble drier and under counter fridge. Lounge with two sofas, two chairs, sea views, fireplace and a large LCD TV with Sky. Second, smaller lounge with a sofa and chair and doors to patio & garden. Bedroom one with sea views, super king size bed, dressing table & two chairs. En suite with shower cubicle, toilet & handbasin. Bedroom two with sea views, King sized bed, wardrobe & chest of drawers. Bedroom three with twin single beds, chest of drawers & hanging space. Family bathroom has a sunken bath and separate shower cubicle, toilet and handbasin.